PennsylvAsia: How To: Asia - Chinese Papercutting at Pitt, April 5. How To: Asia - Chinese Papercutting at Pitt, April 5. The University of Pittsburgh's Asian Studies Center will host the next in its How To: Asia series with a workshop on Chinese Papercutting on April 5. 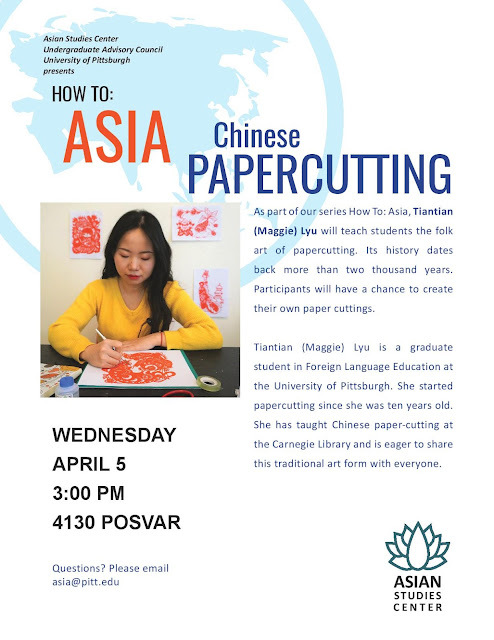 As part of our How To: Asia series, Tiantian (Maggie) Lyu will teach students the folk art of papercutting. Its history dates back more than two thousand years. Participants will have a chance to create their own paper cuttings. The event starts at 3:00 pm in 4130 Posvar Hall (map).